Is there a proper real estate counter offer etiquette that buyers and sellers should follow? How do experienced real estate brokers counter offer real estate deals in NYC? 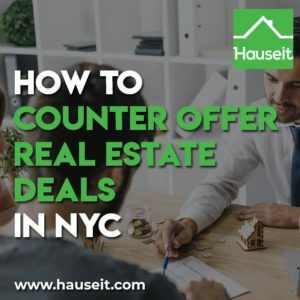 We’ll teach you everything there is to know about how to counter offer real estate deals in New York City and give you insider tips for both sellers and buyers. Most first time home buyers are surprised to learn that there isn’t any set in stone real estate counter offer etiquette or rules in NYC. You can rest assured that real estate listing agents have come across all sorts of characters, from all cash buyers who refuse to provide backup documentation to buyers who are insistent on working with a mortgage lender from out of state. With that said, there is some real estate counter offer etiquette between real estate professionals. For example, it is common real estate counter offer etiquette for sellers to provide some sort of counter, even if the counter is the original asking price. It would be against common real estate counter offer etiquette to not respond or to not provide any sort of counter offer because you felt offended by a low offer. The same real estate counter offer etiquette applies to buyers. Just because you don’t like a seller’s counter offer does not mean you can just ghost them and not respond. It is polite to at least inform the seller or the seller’s agent that you remain firm at your original offer and to thank them for their time. It is poor real estate counter offer etiquette to make a counter offer that you don’t intend on honoring. While a buyer can back out of an accepted offer just like a seller can back out of an accepted offer before signing a contract, it is against real estate counter offer etiquette to do this when you had no intention of moving forward. For example, if you make a real estate counter offer just to see if the other party will accept it, and when they do you immediately disappear and stop responding. That would be considered very poor real estate counter offer etiquette because it would be very apparent that you didn’t make the real estate counter offer in good faith. Pro Tip: Are you buying a home for the first time? If so, the first step should be to find a real estate agent you can trust and who will discreetly provide you with a buyer closing credit. Afterwards, get a mortgage pre-approval letter so you’ll have an idea of what you can actually afford. “The best real estate counter offer strategy for buyer clients is to have patience,” says one of our most successful partner brokers. If you have patience and are not desperate to buy, you’ll always have an edge up when it comes to the counter offer real estate game. In any real estate market, a buyer should seek to have option value by viewing as many properties as possible and putting offers in on multiple properties. This will take more time, but it can also save you valuable time if the one deal you are focused on falls through. For example, if a buyer puts in offers on several properties at levels that are attractive to the buyer, then the buyer may not even need to counter offer. With the proper amount of patience, the buyer can simply remain firm at his or her offer prices and wait for one of the sellers to cave and agree to the initial offer price. This strategy works best for properties that have been sitting on the market for more than 100 days where the seller is desperate to sell. The only exception to this rule is if you’re looking to buy in a hot real estate market and the perfect listing you’ve found is receiving lots of interest. For example, if the open house you attended was jam packed and you even overheard other walk in buyers harassing the listing agent about submitting an offer, then it won’t be the best strategy to just be patient. In a situation where there is real competition, the best real estate counter offer strategy for buyers is to accept the seller’s offer and try to get the seller as invested in your offer as possible. Then, it’s a common trick by seasoned buyers’ agents to ask for a home inspection or second visit during the contract review process. The buyer can then use this opportunity to find issues that need to be fixed before agreeing to sign the contract. The seller will typically refuse to fix anything as a condition of closing because homes are typically sold “as is” in New York. As a result, the buyer may be able to negotiate a credit against the purchase price for the items that the buyer wanted to be fixed. This strategy may of course backfire if there are multiple offers for the seller to choose from. We’ll discuss in the next section how sellers can protect themselves from this common tactic used by buyers and buyers’ agents. Pro Tip: Are you looking to buy a home in a hot real estate market like the San Francisco Bay Area or New York City? Then you may very well encounter a best and final offer process. Read our guide on how to win a real estate bidding war in NYC for tips on how to beat the competition. In a normal or slow real estate market, many buyers will submit an initial offer below the asking price. The expectation then is that they will be able to meet in the middle and split the difference. As a result, you should carefully consider whether the midpoint between the buyer’s initial offer and your listing price is acceptable or not. If the midpoint is acceptable, then you should proceed to make a counter offer. There are many ways to do this. You could make a counter offer that is marginally lower than your original listing price and have both parties eventually negotiate to a middle meeting ground. This back and forth can take quite a while and many sellers will prefer to just be upfront and ask to split the difference from the outset. If the midpoint is not acceptable, then you can either decline to counter and repeat the listing price, or you can make a counter offer that is only slightly less than the listing price as a show of good faith. Either option gets the message across that you believe the initial offer is way too low. “In a heated real estate market the best real estate counter offer strategy for seller clients is to be patient and to get as many buyers engaged as possible,” says one of our leading partner brokers based in NYC. This means accepting more than one offer, especially if you suspect that one of the offers might be a bit shaky. It’s perfectly normal in real estate for sellers and listing agents to continue showing a property until the seller has counter-signed and fully executed a purchase contract. In fact, it’s quite common for sellers to send out multiple purchase contracts to be negotiated. This way, if one buyer falls through or tries to re-negotiate, the seller has other options to immediately consider. Pro Tip: First time selling a home? Read our article on how to negotiate as a seller in NYC and make sure to watch our detailed home seller training video series on YouTube. The seller has authorized me to communicate their response to your most recent counter-offer of $1,300,000 with the original conditions that were presented with their opening offer. There are two parts to their response. First, the seller offers to split-the-difference in the most recent offers and will make a deal for $1,350,000. Second, regarding condition #4, I wish to once again make clear the distinction between equipment and appliances: in the kitchen the seller does not represent that any of the existing appliances are in working order and neither is the individual through the wall air-conditioner. They do not agree to have any of these appliances or the single air-conditioner in working order for the sale of the house. Pro Tip: It’s actually quite common for the typical condo contract to stipulate that appliances will be in working order at closing. However, everything is negotiable through the contract rider that is included with the purchase contract. Rent vs Sell – Should I Sell My House or Rent It out in NYC?